"The time has come, the Walrus said, to speak of many things—" I’ll write about the relevant things too, but not this time. 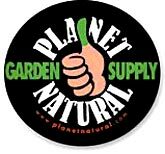 These days I’m writing an article, a website really, on organic lawn care for Planet Natural, which I think of as my little local organic gardening store. That’s a bit (but only a bit) like thinking of the Mayo Clinic as your corner drugstore since Eric Vinje, who runs the place, ships products all over North America and gets interviewed on a semi-regular basis for a lot of "green" stories these days. And that is the fault of the ladybugs, which is another story. "Yeah, I just got off the phone with this guy from –" what was it this time, the Washington Post? I forget. If he’s looking for sympathy, he’s looking in the wrong place. He may be Mr. Rising Star of the organic gardening, but we’re a ways yet from a point at which I have to call him "sir" or he has to tuck in his shirt. So like I said, I’m writing this article, and the most amazing stuff drifts across my computer screen. It’s one of the fringe benefits of the research-and-write job: there’s all the information you learn about the actual topic, but there’s all this other stuff too, the odd facts that come zinging in at an acute angle to the story as I understand it, go whang into the center of the piece and stick there, quivering. There are over 200 public lawn bowling greens in present-day Glasgow. The Levitts, who built some of the early cookie-cutter suburban developments in the US, (including the first Levittown, on Long Island) didn’t believe in basements (they pioneered cement-slab houses), but they set up a little newspaper for each development. –The first North American golf courses were built in Canada. –Up to 50% of homeowners who use pesticides don’t read the labels or follow the directions. –Clover used to be considered a desirable part of upscale lawns. –Almost none of the turfgrasses available in North America are native to the continent. –Lawn bowling or one of its close cousins is five to seven thousand years old. –The pesticide Mancozeb is marketed under at least fifteen other names. –Almost everything Americans (Canadians too, probably) did to care for their lawns in the 50s encouraged crab grass. –A hundred and thirty-eight Canadian towns and cities (including 2 million-strong Toronto) and one entire province (Quebec) have banned the cosmetic use of all synthetic pesticides. –Switzerland banned 2,4D in 1988. –You can vacuum up cinch bugs from a lawn, and at least one parks director in Nova Scotia does so regularly. –In parts of Canada, pyrithium is legal against certain pests, but insecticidal soap and NEEM are not. Go figure. Having taken a breather last year, I tackled the tomato front again this year, bringing in the runts from the spring planting, little ones that I’d stuck in pots rather than tossing, plants that were only just starting to flower when I repotted them and brought them inside. As the photo shows, they do produce tomatoes–that photo is from December, and there have been more tomatoes since then. The thing is, there aren’t many–the photo really gives a false impression, since one assumes that the rest of the plant is similarly laden with ripe fruit. Not so. I seem to remember working myself into an awkward, yogi-worthy twist for that photo, in an attempt to get the only two tomato clumps into the same frame. Even worse, the tomatoes I do get don’t taste that great. It’s no wonder, I suppose, as our house temperature rarely gets above sixty, and I have no really good sunny windows to offer them. This year I’ve done my best by them, shaking their blossoms daily to encourage germination (this works), ferttilizing, snipping their tips when they outgrow their stakes, and generally mooning over them. The results? Of the seven plants I brought inside, one died outright (just pined away for no clear reason, like a girl in a ballad), and the rest, while still producing both flowers and new greenery, are clearly feeling the strain of a winter indoors. They’re afflicted with a variety of pests and diseases I haven’t had the energy to identify, much less fight. Every year I bring plants in, and every year they cause more trouble than they’re worth. Yes, even I am ready to admit it. My family could have told me (actually, they DID tell me) this years ago, but I’m a little slow. The addict is the last to know or admit she’s got a problem. But I’m finally ready to take that first step, I’m ready now, lord, I see the light: tomatoes belong outdoors, not in. If anyone knows different, keep it to yourself, if you value your life; there’s no telling what my family might do to someone who re-instills in me the belief that I can raise tomatoes indoors. Check out the interesting discussion about eco-terrorism, definitions of green, and the torching of several multi-million-dollar homes in a Seattle suburb. 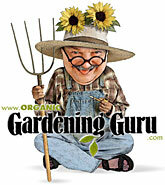 The post, called "My Green Is Greener Than Yours" appeared today–oops, yesterday, (2/4/08)–on Garden Rant. The last of the summer’s tomatoes are long gone by now, and December’s fresh tomato soup is a but a fading memory. Of course, there are always the tomatoes inside, but somehow I doubt they’re going to produce enough fruit to make soup. When I look up from my computer I see a tomato plant in a six-inch pot. It’s maybe a couple of feet high, and while its upper reaches are green, all the lower leaves are yellowing. 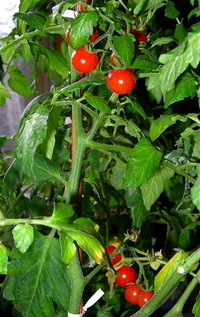 Three ripe cherry-tomatoes hang from it, two together, one alone. I am looking at a plant that might make it till spring, but even if it does, is it just going to infect the rest of my young seedlings with whatever is making its leaves curl inwards? Two years ago I brought in a number of outside plants including massive things containing tomatoes, hanging pots with strawberry plants, and a range of assorted others. My husband and sons greeted this influx of outdoor greenery with only the occasional muttered aside; "Want to make the house look like a jungle?" from the sons, or a cautiously worded suggestion from my husband: "I’m not sure the strawberries will do that well inside." This after I’d virtually obscured our livingroom windows behind a combination of hanging plants and potted ones whose greenery fitted together as neatly and tightly as puzzle pieces. I never precisely conceded that he was right, but I did eventually retire the hanging strawberry plants to the garage for the duration of the cold season. The tomatoes, however, I refused to reliquish, and one made it all the way through winter and all the way through the following summer, which it spent on our patio, doing its tomato thing, which resulted in a modicum of tomatoes. It was more a curiosity than a vegetable, a conversation piece I used to startle fellow gardeners, including the visiting plant experts from Mali: "That tomato is over a year old," I’d say, but in an easy, offhand manner, as if this were nothing special, at least in my garden. Only I remembered the slow train of dead and dying plants that I’d escorted out of the house through that late winter and early spring. The tomato I bragged on was the only one that had survived. So you’d think I’d have learned, wouldn’t you.